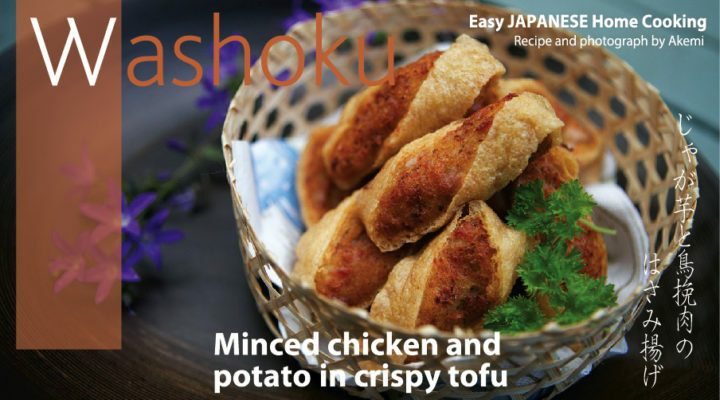 I acquired the original version of this recipe from my Japanese friend who is a fabulous cook and frequently entertains people in her London home. She uses taro potatoes, but these can be hard to find, so I replaced it with the humble British spud and modified the recipe slightly. 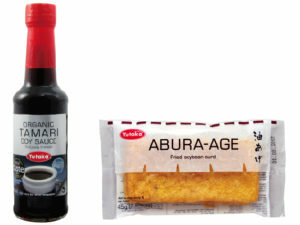 ‘Abura Age’ is fried soy bean curd, a product you can now buy in UK. It is light and full of nutrients and you often find them floating on top of miso soup. I always keep a packet or two in the freezer as they are very useful for putting in stir fries as well. The trick to making abura age look good is to twist the strip slightly just before it is put into the oil. When cooked right they are very crispy on the outside but incredibly soft and delicious inside. Start by peeling the skin off the potato. Slice the potato to a 1cm thickness and cook in microwave for 5-6 minutes at 600w or until it has softened. Peel the skins off carrots and ginger and then use a food processor to chop them finely. If you do not have a food processor then use a knife to cut the carrot into very small pieces and grate the ginger. Place the carrot, ginger, potato, chicken, soy sauce, salt, black pepper, flour and mayonnaise into the food processor and blend them for 30 seconds or until the mix becomes smooth. Alternatively you could do this with a potato masher in a bowl. Take the fried soybean curd (tofu) and use a knife or scissors to cut one end of the short side so you have an opening to the cavity. Stuff the bean curd parcel with half of the mix, using a teaspoon to distribute it evenly inside. Be careful not to break the outer layer. Repeat the filling process for the other bean curd parcels. Lay the bean curd parcels horizontally on a chopping board then cut into 2cm strips. Heat at least 5cm of oil in a deep frying pan. When the oil reaches 160 °C, twist each soybean curd strip by hand slightly and place it to the oil. Cook for 2-3 minutes until the potato side turns slightly brown and the bean curd side becomes crispy.